The Camden County Prosecutor’s Office and Pennsauken Township Police Department are seeking the public’s assistance in identifying a vehicle. 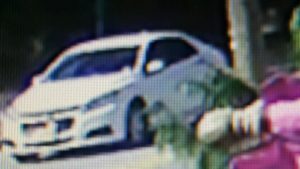 The vehicle shown below was possibly used during a home invasion that occurred at approximately 2:24 p.m. on October 3, 2017 on the 7500 block of Baxter Avenue in Pennsauken Township. The suspects who entered the home are described as Hispanic males, wearing black hooded sweatshirts and black pants. The driver of the vehicle was described as a white or Hispanic male with a heavy build and a beard. Camden County Prosecutor’s Office Detective Peter Longo at (856) 580-5854 or Pennsauken Police Detective Aerika Long (856) 488-0080. Released Friday, October 13, 2017.